About now, you’re wondering a few things. If you’re at all scientific, you’re saying that none of this is possible—if you haven’t already walked away from sheer disgust at the unlikeliness of any of these events—and you’re probably right. I have done a bit of research myself—and it would seem that it’s more likely that a superpower comes from magic than by any scientific means. So when I say that Larabee’s lab exploded and accidentally created an ooze that changed the very nature of the fabric of my clothes—and though I deny to this day that it had anything to do with spandex—you don’t believe it. That is your right. I wouldn’t believe it, either. If it happens, it might just be a relief. Oh, right. I was supposed to answer the other question. How did we get rid of the smell? It wasn’t easy. This is my life. Nothing ever is. Clayton checked the clock again. Finally. This would be the real test, right? He had to go back into his normal form, and he’d have to see if he split his pants when he did it. 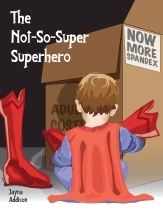 If he did, then it was back to the drawing board again—and back to Larabee’s obsession with spandex. Clay really hoped this worked. If it did, other than the smell, he could have a normal wardrobe. Of course, going everywhere smelling like this would be a real problem. He couldn’t forget that, either. If he smelled, he couldn’t do much of anything. People would know he was there just by scent, and if he had to do a quick duck and hide because he was switching forms involuntarily, they’d realize he was the same person by the smell. The smell had to go. “I am not a lab rat, Larabee. If I wanted to be, I’d go in to the nearest doctor—or, heck, my boss man in the suit—and show them what I can do. Then I’d be experimented on until there was nothing left of me,” Clayton muttered, not liking the idea of a hazmat shower. He didn’t want to stand around here waiting to dry off, and these were the only clothes he had here. Unless he wanted to put on one of Larabee’s costumes, but that just wasn’t going to happen. “Oh, that. Well, that’s not going to work if I smell like this,” Clayton grumbled, going to the hazmat shower. He looked up at the spout and sighed. This would be about as pleasant as getting doused with the ooze. He turned it on, letting the water rush over him. After he was thoroughly soaked, he shut it off again and stepped out. Working on that was a great concept, in theory. It didn’t do Clayton much good, though. He was able to get the smell out of his hair and off his skin, but it lingered in his clothes and every piece of clothing that Larabee tested it on after that point. It wasn’t going to go away. So much for the salvation it had seemed to be at first. It would have been an ideal solution… Only it wasn’t. It couldn’t be. The smell was a cross between rotten eggs and road kill, and it did not go away. Those famous odor removers that were always being advertised on television? None of them did a thing. The many brands of laundry detergent could not make the smell disappear. It seemed to get worse, depending on whether or not the detergent had any kind of fragrance in it or not. They tried drying it in the sun. That sometimes baked smells out of things. Maybe it baked it into the clothes. Clayton was starting to believe that it would never come out of the clothes. It would never die. They’d done everything they could think of—they’d even tried absorbing the smell with cat litter. Clay didn’t think they’d ever get that odor to dissipate, and so that left them with nothing. Larabee couldn’t figure out how the stuff had gotten made, either, so that wasn’t much help. They were running out of it to test, though they had at least proven that Clay could be any age and have the clothes fit. He just couldn’t have clothes that didn’t smell. “Hey, that gives me an idea,” Larabee said, and Clay shook his head just before he was doused with another coffee.